Quite a few artists have asked me to write about studio lighting. This is an area that is like the Mac vs. PC debates. I will offer the information I have and also my opinion about what I feel is important. After that—you’re on your own! If you don’t have a studio with north light, you need artificial lighting. Period. You can’t properly paint your canvas without accurate light. 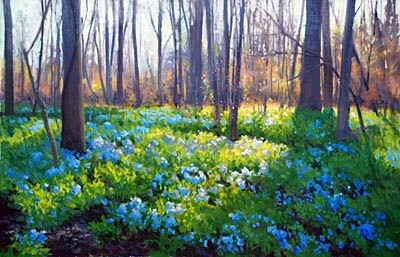 Remember—the light you use in the studio is not the light the painting will ultimately be viewed in. Your gallery, an exhibition space and any potential buyer will have a unique set of lighting conditions. Your painting is going to look different in all those situations. You should have light that isn’t too cool or too warm so you can accurately judge color. Otherwise, you’ll be mixing orange when you think you are mixing green. As a painter, I have used incandescent, fluorescent and halogen lights. Let me break down the various lights without getting too technical. The worst solution for your paintings because the light is so warm you will actually paint things cooler than you want. These lights can be a great solution as long as you paint small. The problem is area coverage. They don’t emit a very large covering surface, so you have a spot effect. The light around the spot drops off quickly, giving you an uneven illuminated surface. They also emit a lot of heat, so just adding lots of bulbs for an area isn’t a solution. Not all halogens are the same and again check the temperature of the light they emit. Solux bulbs are the best halogens on the market, but they are expensive compared to lifespan/ cost ratio of fluorescent bulbs. These bulbs are probably the next best thing indoors to north light for most artists. They are relatively cheap and efficient and have good but not great color indexes. They tend to spike in the blue green range of the spectrum and drop off too dramatically in the red violet range so do your homework. You will see a lot of back and forth discussion in forums about K, CRI, CCT and the CIE ratings. CIE is the quality grade rating of the light, a CIE #51 determined rating for A or B is what you want. They go down to E with A being the best and E the worst. Carpet and wall colors affect the light on your canvas. Even the housing the lights are in will affect the light. Stick to neutral colors for your walls and floor. Gray with a reflectivity of no more than 60% is best. Consider other aspects for your situation like unit cost, energy efficiency and bulb life. I always buy the best I can afford and make do until I’m in a position to upgrade. When looking at ratings, remember picking your bulbs based on any one rating will not give you as good of an outcome as looking for a combination of higher ratings for the type of bulb you choose. Chromaticity, color temperature and the quality grade, as determined with CIE 51, is a much better procedure for finding a light close to daylight. Great post. I dont have any of these factors going on. I set up next to the window and whatever light I get is what I get. I couldn't do a still life yesterday because of this because I had to keep gettin up to check the colors. I think that was a significant moment for me because I was recognizing what I was seeing as not lining up at all with my knowlege of color. This was a good problem for me because I have begun thinking of the solution. Which means my paintings will get better. I embrace the problem solving process. I never run from it. So this post is timely for me. Fascinating post. I have tried to have a mixture of light sources in my studio. Luckily I have some northern light but I will look at a few specialty lighting stores for your suggestions. However, I am in love with the lighting and color in the two paintings on this post. Goeorgous vibrant blue flowers in the varied light and the oranges and blues next to each other in the second paitning. Wow, just, wow! Hey Armand, I used to use a color corrected lamp with both florescent and incandescent light bulbs. The problem is, like you say about halogen, it's more of an upclose spot light, and that caused the paintings to look good on the easel, but be very dark in other lighting. I found some color corrected, full spectrum bulbs that supposedly come from Northern Earope. Long, dark winters cause depression, and they've found a solution with full spectrum bulbs. However, when I've painted in color corrected light the images looked very warm in the unnatural lighting in most people's living rooms. So nowadays I hit somewhere in between. It'll be a little warm in a living room, but a little cool viewed in natural light. But not enough either way to harm the final affect. All the things you said are true that is why there is no one solution for everybody. When I am placing a commission I always check the space and try and adjust for it back at the studio by looking at the painting under similar lighting conditions so there are no surprises. I am an amateur painter because I love art. However, I am an expert marketer with over 40 years of experience. 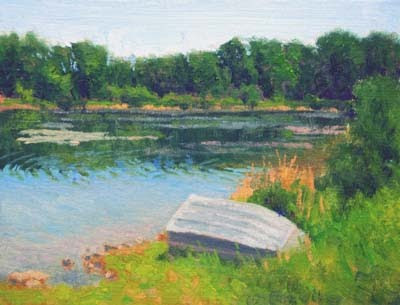 Your painting at Riverbend Park in Great Falls is masterful. I checked out the price and it is underpriced! Everyone who tries to sell something is torn between pricing something too high and thinking, "with a lower price I might sell more. Sometimes it goes the other way. For example, what if that painting was listed at $500. Some people would say, "he must not be very good or valued by others." Thank you for the informative post. I have north light in this studio but I always turn the lights on as well. Currently I have halogen indoor flood lights (which I don't recommend to anyone who doesn't live in the Yukon -they get uncomfortably hot!) Hopefully I'll be in a new studio soon. It will have north light too. I've been thinking about getting different lights to work by. You're post was great to help me figure out what I need. Thanks.